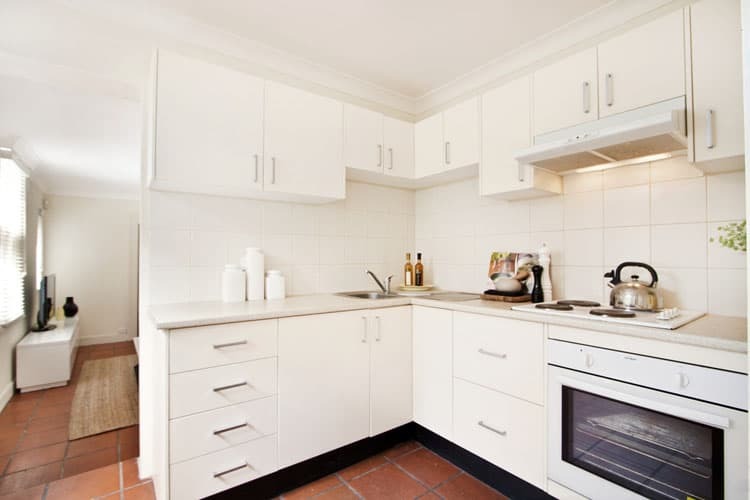 White kitchen cabinets pose a conundrum. They are beautiful, add light to the darkest of kitchens and work with any decorating scheme. However, they can show stains. 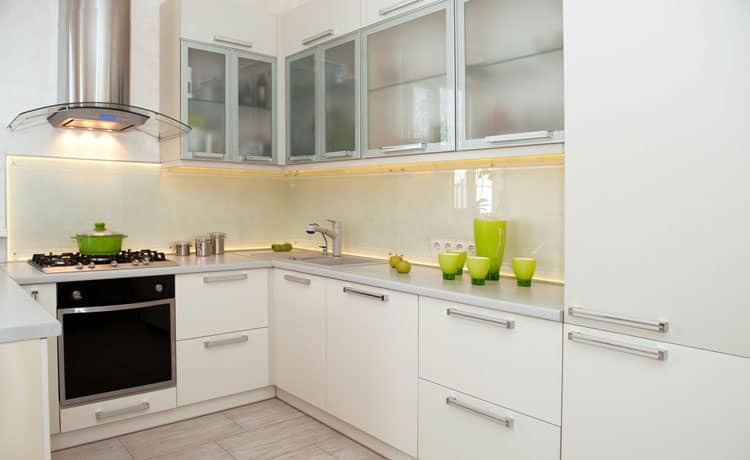 Fortunately, a monthly cleaning with a solution of warm water, baking soda and vinegar will keep those cabinets shiny. 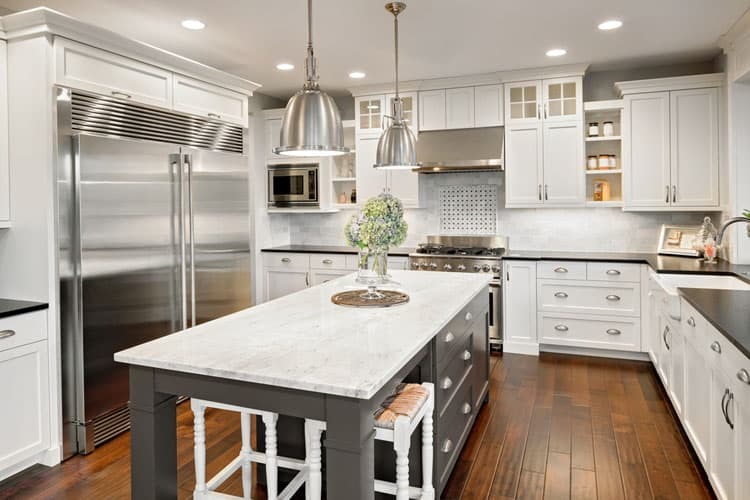 Go ahead, wave the white flag, surrender to the beauty of white kitchen cabinets. Homeowners who like to entertain should follow the lead of this white and bright corner pantry. 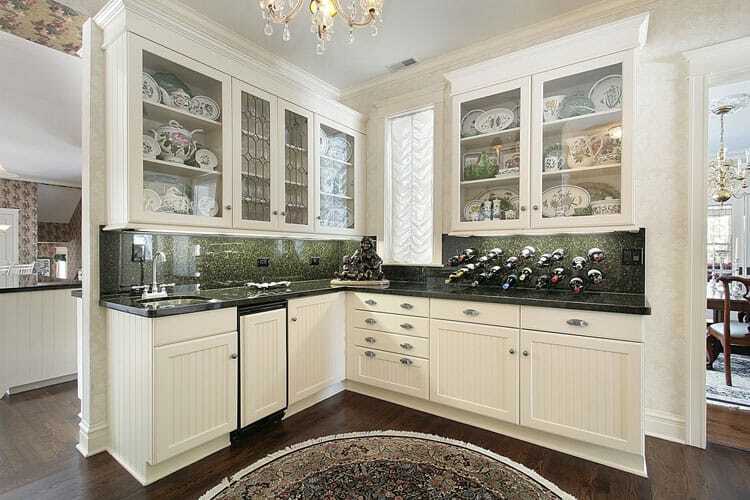 The upper glass-front cabinets are the perfect place to display your coveted China collection while the beadboard front bottom cabinets are a stylish place to stash your linens and other kitchen supplies. 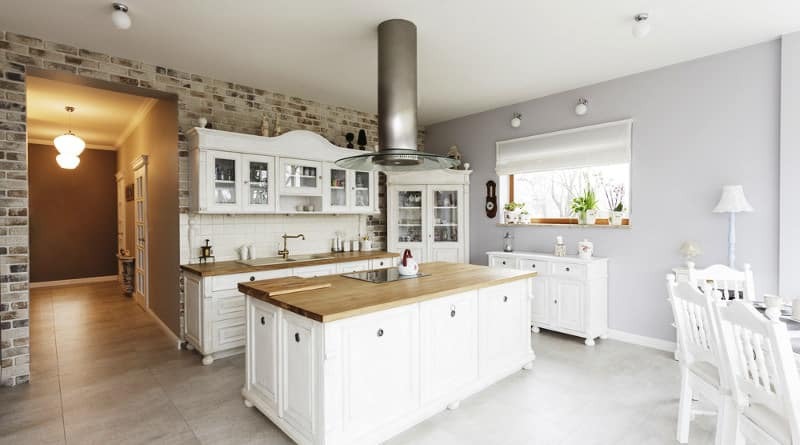 These homeowners know how to properly use white kitchen cabinets. The white raised paneled cabinetry pop against the creamy-white walls and the the green granite countertop is the perfect balance for the black appliances. The decorative baskets on the top of the upper cabinets fill in the dead space and add a shot of color. Contemporary touches are found throughout this kitchen. Features such as the upscale oven with raised burner cooktop and the double sink, each with its own faucet, lend convenience and style. The white cabinetry stand out against the tile backsplash which perfectly incorporates the kitchen’s other two colors, the tan walls and stainless steel appliances. Wow. 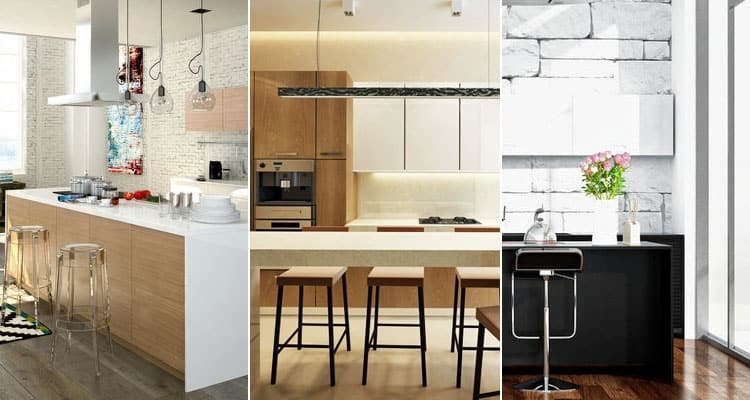 This kitchen makes a major design impact. The innovative use of windows instead of a traditional backsplash paired with the glass door to the wine closet is enough to make anyone swoon. The white cabinetry paired with the white walls lends a sense of calm while the ornate gold pendant lighting add a slight touch of drama. This small kitchen doesn’t skimp on the design details. 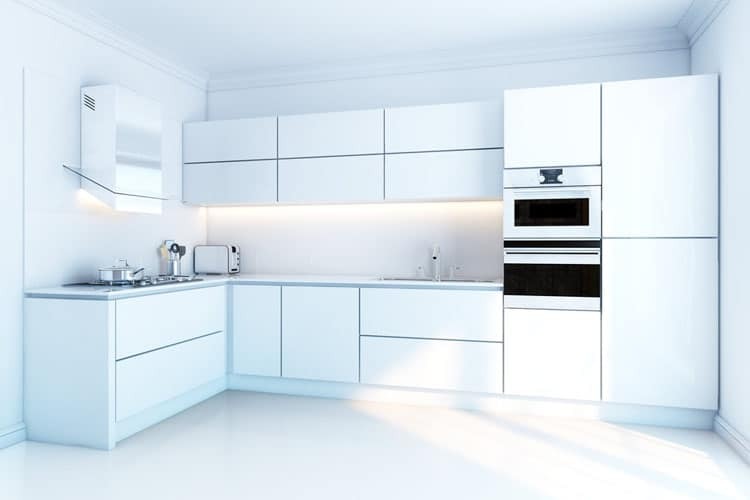 The refrigerator blends in because it’s covered by cabinet panels which match the other panels. The butcher block countertop serves as both a cutting board and serving surface. The use of stainless steel for the appliances, cabinet handles and ventilation hood provides a sense of cohesion. This kitchen may only have lower cabinetry, but that doesn’t mean it’s lacking for storage space. 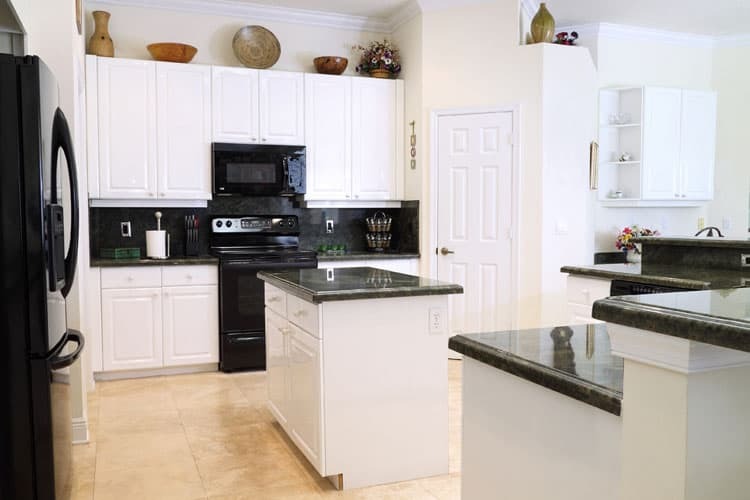 The everyday appliances are easily accessible on section of countertop, leaving the remainder of countertop open for prepping and serving meals. The blond-colored tile floor and light brown tile wall keeps the space feeling modern and airy. Thoughtful designer touches abound in this small kitchen. 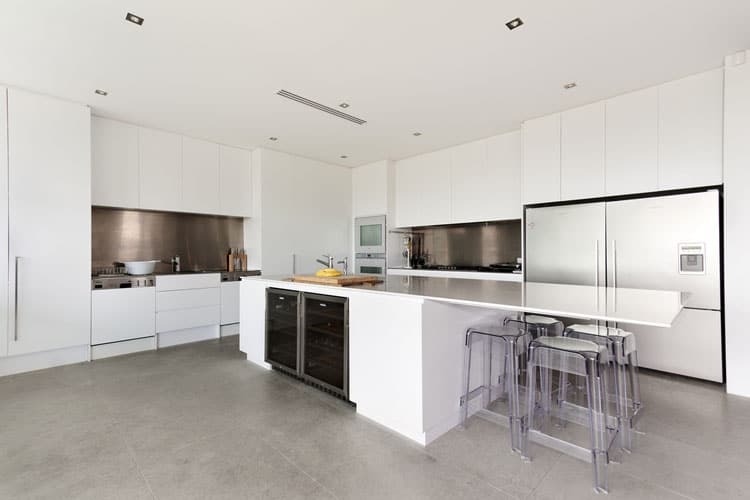 The combination of flat-paneled white cabinetry and white walls help the kitchen feel spacious. 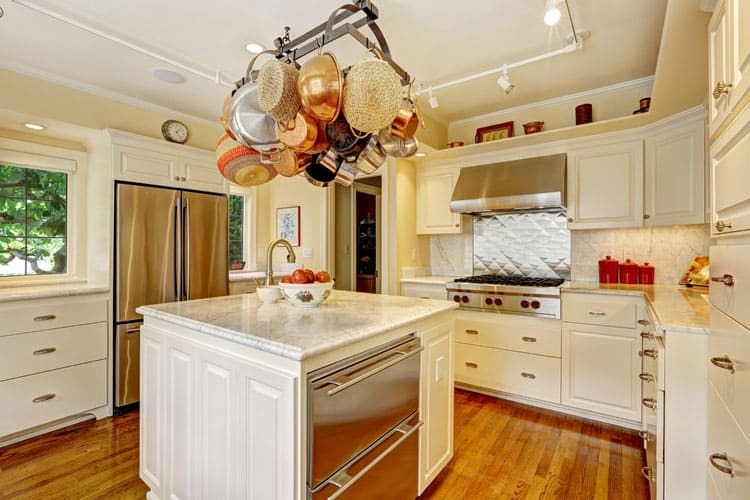 The matching stainless steel sink, stove and cooktop provide sleek cohesion. The rich dark tones of the countertop gives the entire space a contemporary feel. Any avant garde chef would be right at home in this kitchen. The sleek flat-paneled white cabinets combined with the double ovens make this space feel and look more like a food lab than a homey kitchen. 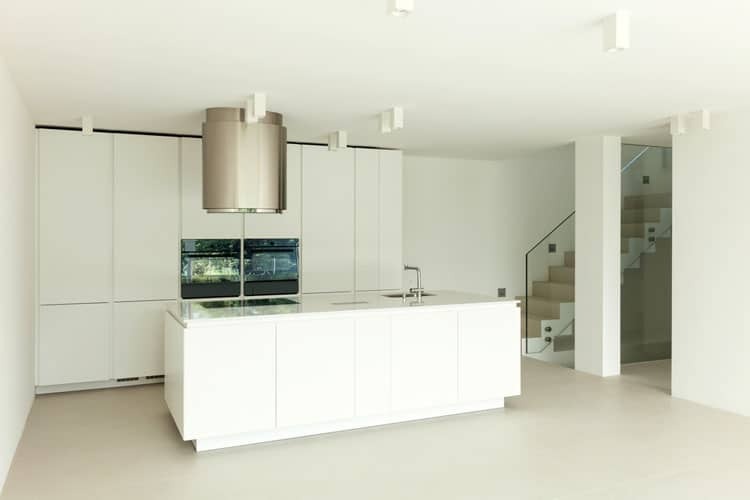 The room’s major feature, the cylindrical ventilation hood, is both an art statement and much-needed appliance. This family kitchen is ready for anything. Imagine making your favorite recipes in this stylish, yet comfortable kitchen. 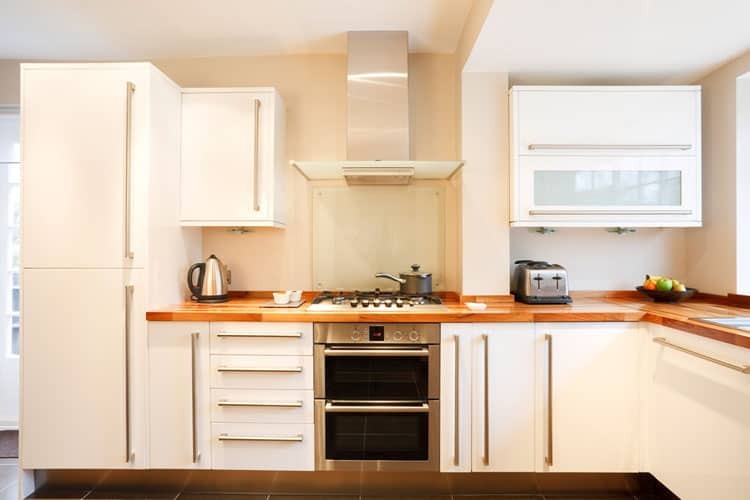 The classic style cabinets work nicely with the contemporary stove with raised burner cooktop. The use of beadboard on the side of the cabinets adds an unexpected country feel. 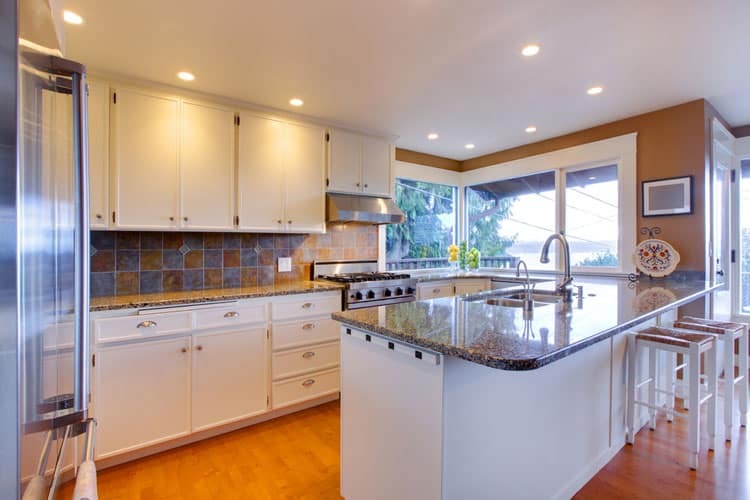 Retro touches blend in seamlessly with modern conveniences in this professionally designed kitchen. The antique pendant lighting, vintage-inspired valance and display of treasured China are the retro touches that make this modern kitchen stand out. Thoughtful design touches, such as the red stove knobs that match the red dutch oven, add a shot of whimsy. White cabinets bring light to this otherwise dark corner. This corner kitchen unit looks bright and spacious due to the fact that the appliances are white and match the cabinetry and walls. A few assorted decorative items and kitchen tools bring in some colors that break up the monochromatic palette. Where to begin? This chic country kitchen has it all: an abundance of custom white cabinetry in both the kitchen and the pantry, marble countertops, plus restaurant-quality stove and refrigerator. The addition of natural and artificial greenery and plants bring nature inside and the dark hardwood floors lend a subtle country touch. 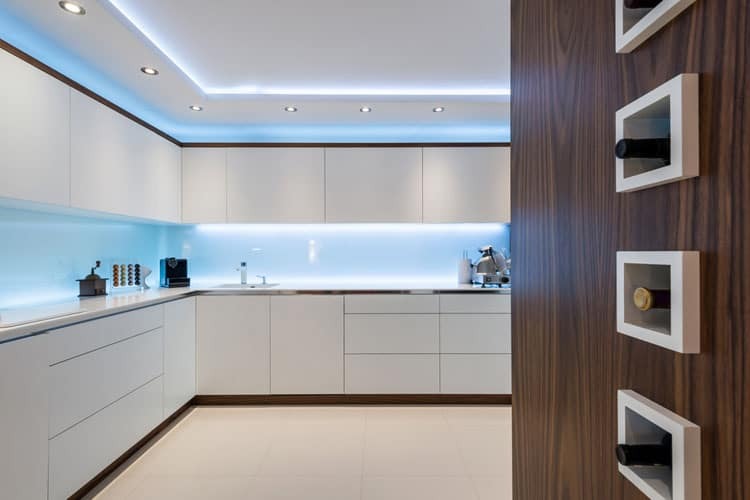 This futuristic kitchen is the ideal blend of functionality and style. The two distinct cooking surfaces allow for multiple cooks to easily work together and the expansive side-by-side refrigerator-freezer can store a month’s worth of supplies. The large island, a portion of which floats over four acrylic stools, doubles as a prepping and entertaining space. This kitchen will stop you in your tracks. 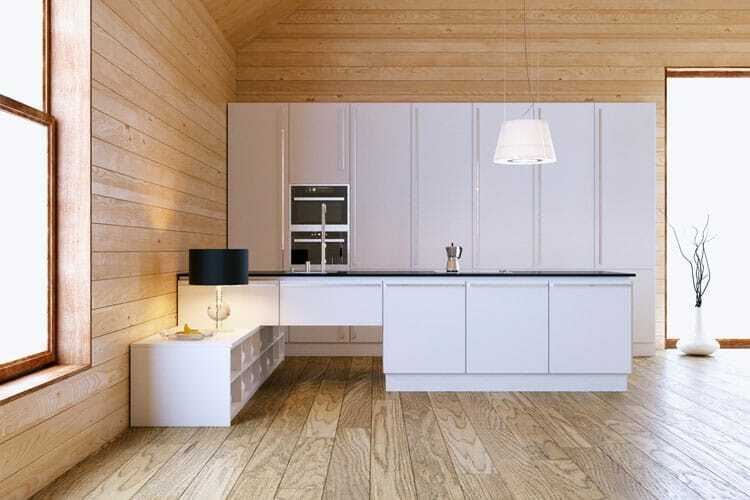 The use of white flat-paneled cabinetry creates a soothing, spa-like atmosphere when used in this wood-planked room. The peninsula is home to the undermount sink and induction cooktop as well as a quirky pass-through. This pass-through under the peninsula reveals a section of cube-shaped storage. 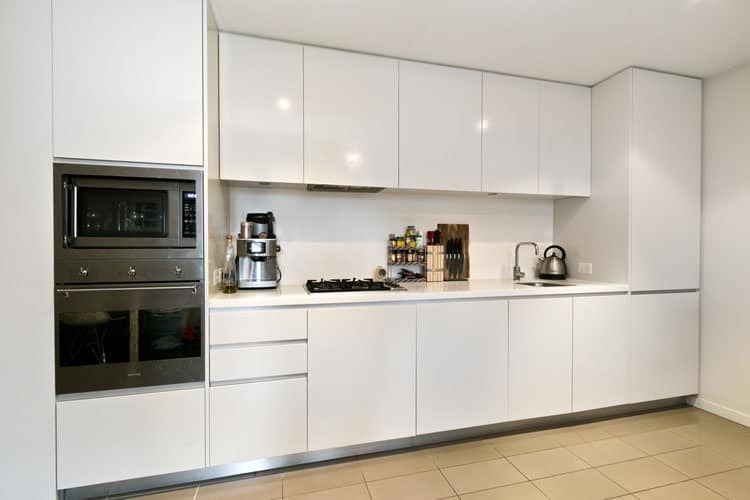 Behold this sleek, spacious and modern kitchen. The cabinetry, walls and countertop are all white, but this space is far from boring. The ultra-modern ventilation hood is also white, but notice how the Plexiglas shield mimics the black grids of the cabinetry. Masterful! 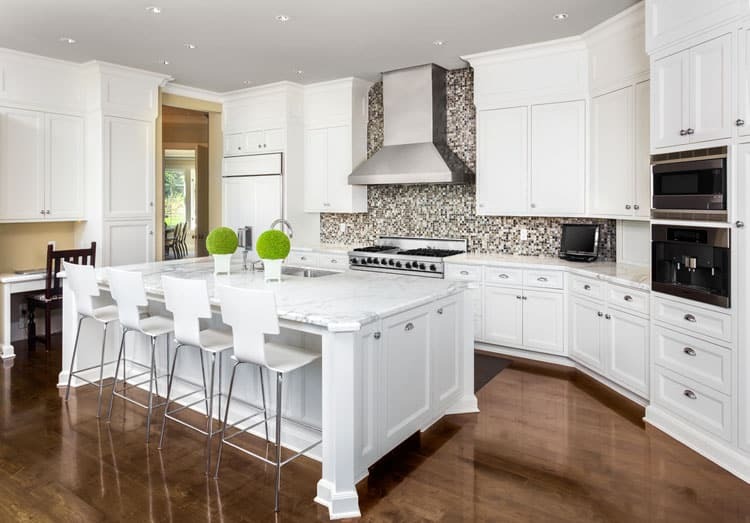 The pairing of white cabinetry with white marble countertops elevate this kitchen from charming to glamorous. Strategic use of the color red, such as for the canisters and picture frame, make these decorative accents stand out. This kitchen is a place to get stuff done. 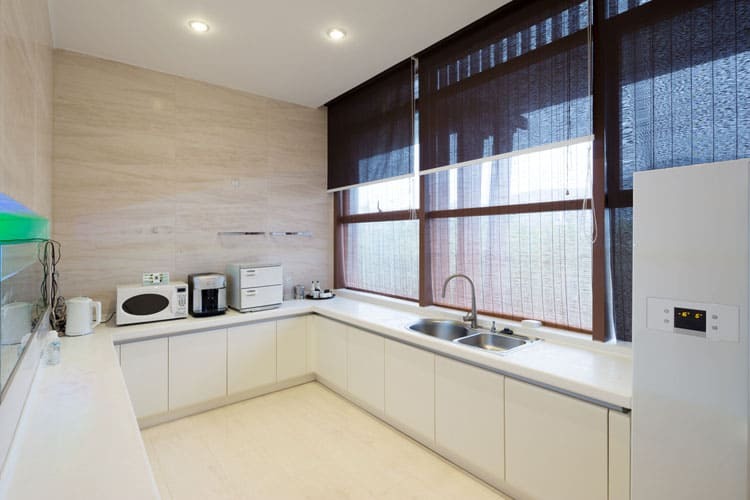 You can cook dinner on the restaurant-style cooktop, bake bread in one of the ovens, take care of paperwork at the built-in desk and talk to four family members at the same time. The false cabinet panels over the cabinetry make the cabinets appear larger than they are as well create a regal look. 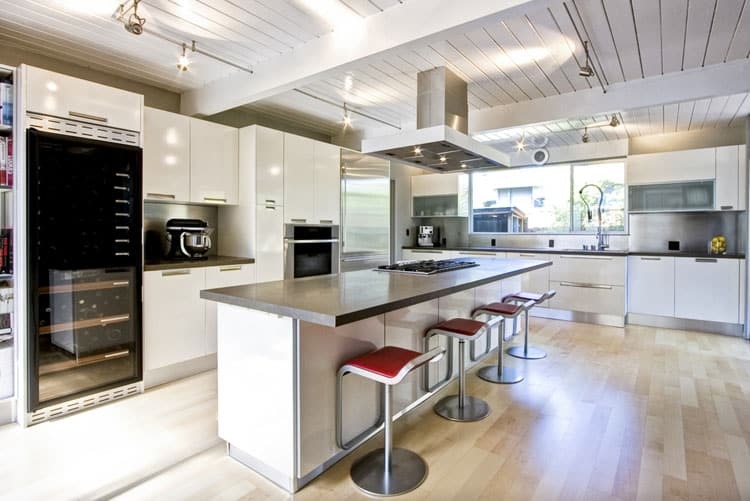 The mix of white lower cabinets and frosted glass-front upper cabinets creates a kitchen that is fun and functional. Funky features include the chartreuse accessories, futuristic ventilation hood and the upper glass-front cabinets that you flip up to open. This kitchen makes the most of the space it’s in. White walls, cabinetry and backsplash create a calm, serene environment that is enhanced by the touches of dark woodwork. The woodwork is continued on the corner wall, which is also home to built-in wine storage cubbies. Classic details abound in this kitchen. Note the tile floor, marble backsplash and vintage-inspired stove. 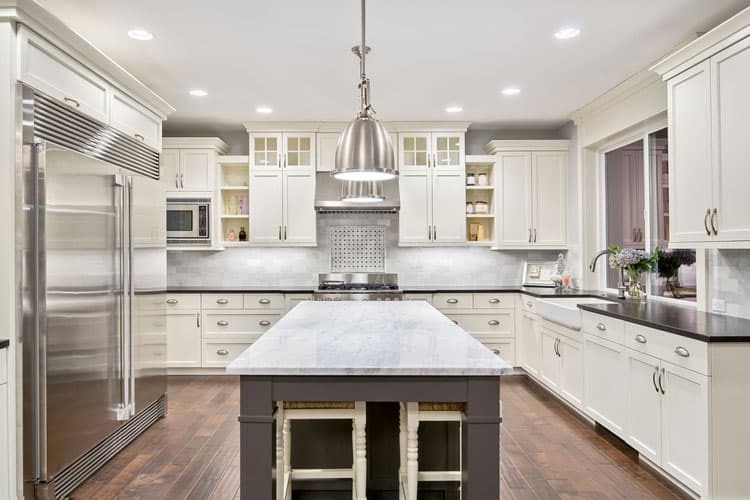 The use of gray trim on the white cabinetry not only lends a patina but matches the stainless steel details of the appliances. The view of the veranda only enhances the beauty of this dream kitchen. Imagine the meals you and your fellow gourmands could create in this space. There’s ample amounts of countertop space where one could work, as well as spaces dedicated to certain tasks. 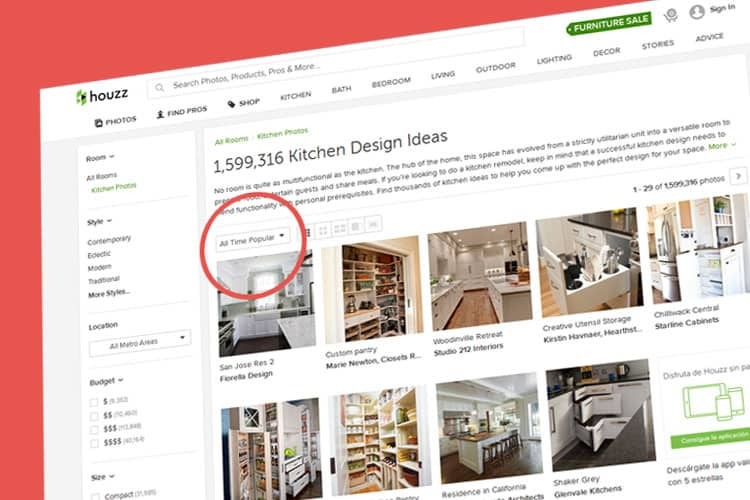 Check out the workspace where one could whip up bread or cookie dough with the Kitchenaid mixer. The stainless steel backsplash lends a commercial kitchen feel. This kitchen has no shortage of functional and stylish cabinetry. The use of white cabinetry around the room’s perimeter contrasts beautifully to the brown cabinetry used for the kitchen island. 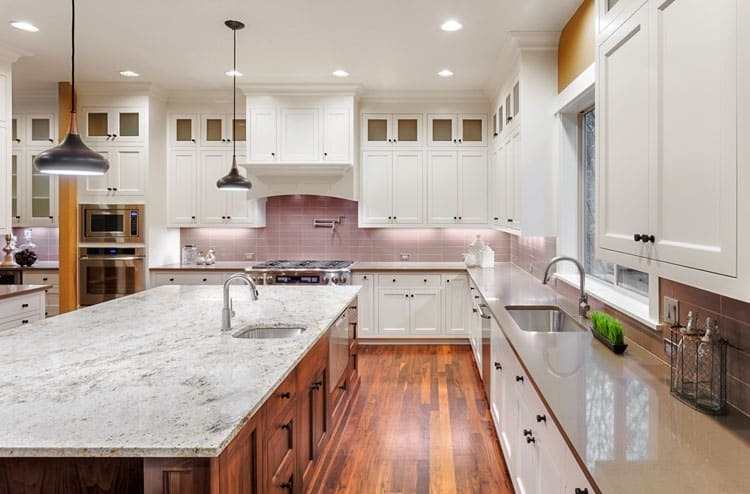 The homeowners’ choice to use under cabinet, recessed and pendant lighting brings in ample light to this large space. 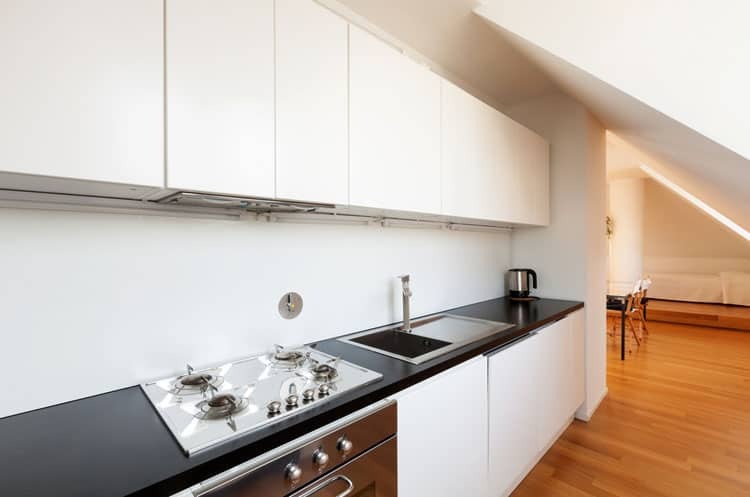 Sleek and stylish, this kitchen packs a lot into a small space. The use of floor-to-ceiling cabinets on either end anchor this space and allow for the workspace to be centrally located. The small cooktop and sink require smart and efficient use of both cookware and dishware. Retro-Inspired touches abound in this small kitchen. 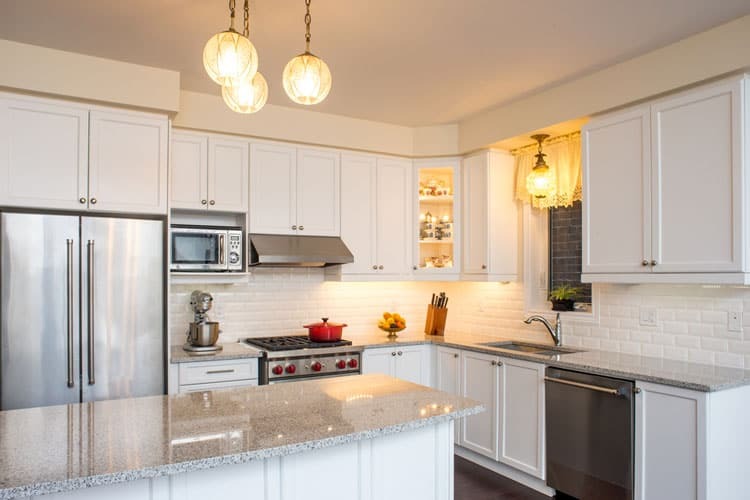 White subway tiles amplify the classic feel of the classic white cabinetry. High-end touches such as marble countertops, stainless steel appliances and raised-burner stove lend style which is only amplified by the display of antique tea cups. The vintage pendant lights beautifully finish the space. Upscale and modern touches such as the high-end stove and marble backsplash make this kitchen swoon-worthy. 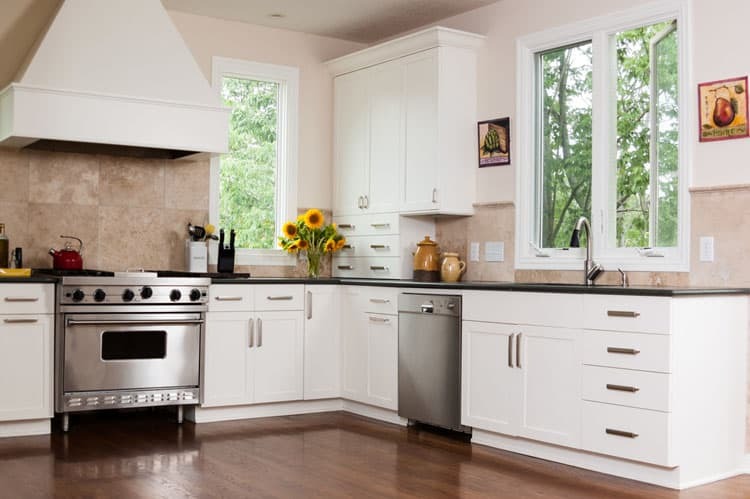 The ventilation hood covered by white cabinetry that matches the other cabinetry is a skillful design touch. The gleaming hardwood floor lends warmth. Wow. This family kitchen doesn’t scrimp on the gorgeous and timeless details. 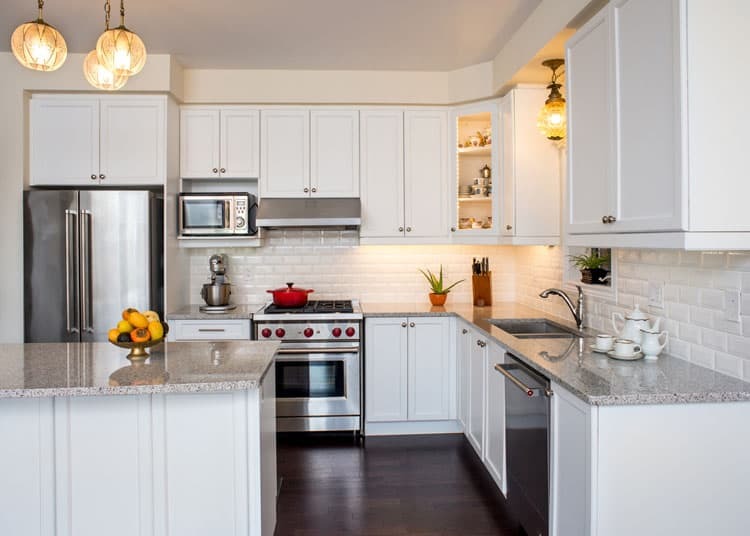 The subway tile, featuring several shades of light gray and cream, not only complement the classic white cabinetry but the high-end stainless steel appliances too. Details, such as the space for stools to be tucked in under the kitchen island, provide for extra floor space when family isn’t visiting the cook. 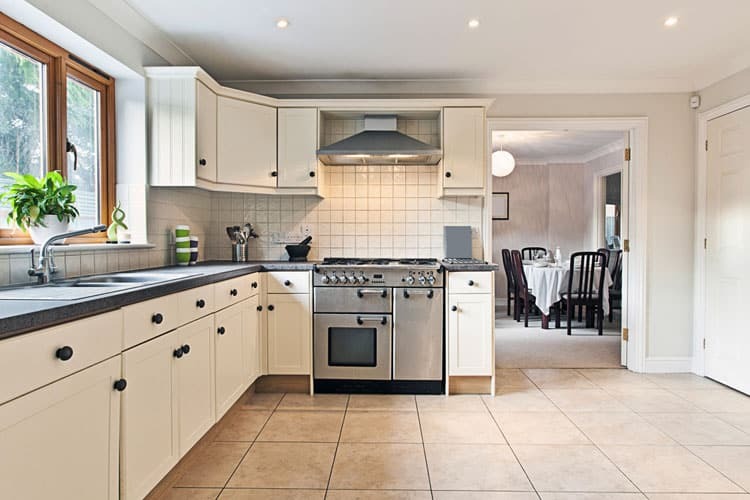 This classic kitchen is a home cook’s dream. 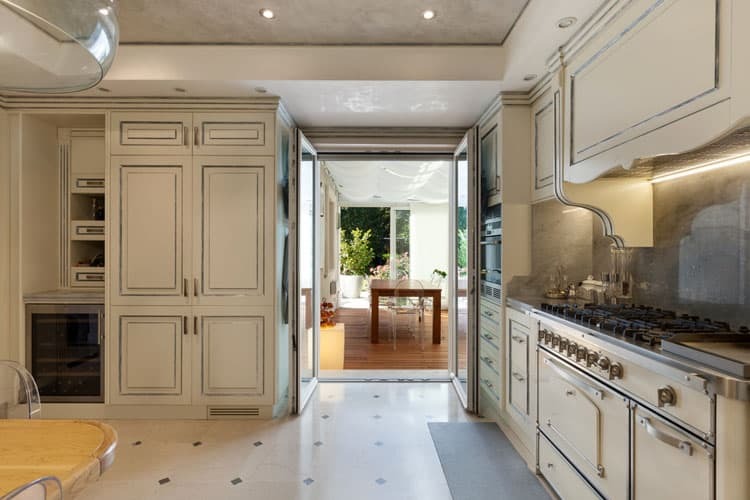 The large double-sided refrigerator and freezer unit provides enough space for several months worth of food while the raised-burner cooktop is a gourmand’s dream cooking space. The abundance of solid slab stone countertop provides tons of style and usable workspace.